Full disclosure; I am the head of business development for Yellow Pages Group in Canada, check out my LinkedIn profile. What I will share with you below is public information that I felt was time to compile into one post. With the recent announcement of the SMB Targeted Campaign by YPG and with prominant bloggers like Greg Sterling posting, “YPG Aims New Brand Campaign at SMBs” the question will be raised – is it true? 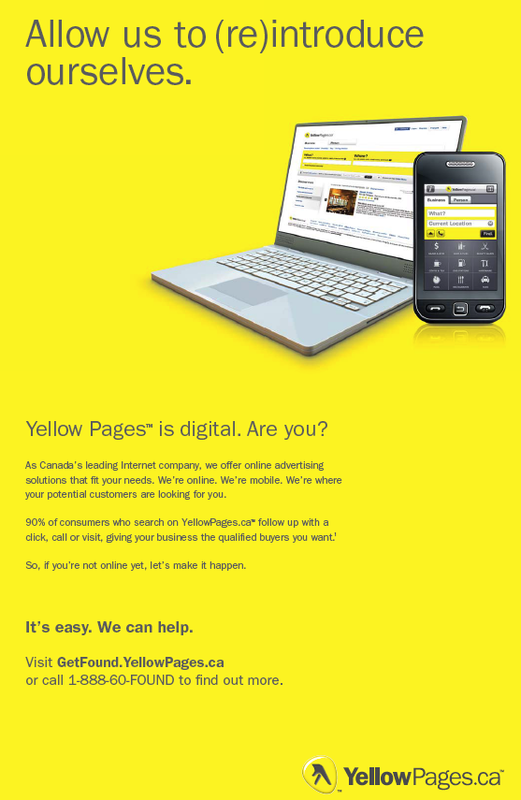 Is Yellow Pages Group Canada really the largest Canadian Internet company? I get asked a lot about YPG in networking events, from former colleagues and friends as to what exactly is YPG doing in the online space. Many people wrongly assume that we simply print books and that we are irrelevant to SMBs when it comes to the web. When explained to them how active YPG is online, what properties we own, and our mission to put our advertisers in the “path of ready to buy consumers”, they usually start to see the full picture of how RELEVANT YPG actually is in the Canadian Internet Landscape and why I am as passionate as I am about this business. When I talk reach, I like to use a third party company to measure relative reach. 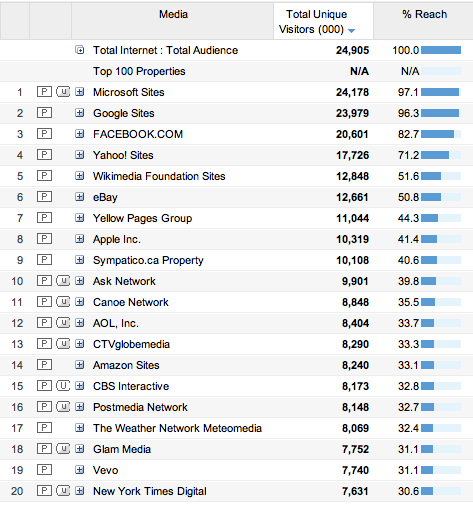 Therefore, below I will use ComScore Media Metrix as the benchmark to speak about reach. There are other methods to track reach, a) internal logs, b) alexa, c) compete, etc. but in the Canadian Media Landscape – Comscore is still a standard when it comes to companies making decisions about spending on digital ad budgets as well as completely independent, therefore I use them as the benchmark. If you re-sort this list based to only Canadian Owned Companies, or majority owned by Canadians, the top 20 list breaks down to only 6 companies. Based on this metric, it is clear that YPG is in fact Canada’s largest Canadian Owned Internet company. One important aspect of the YPG network is its unique position of “ready to buy consumers” who have location intentions. The portfolio of properties that makes up Yellow Pages Group (see below) are a collection of sites that have intention to buy as a common element. This is a powerful as other leading web properties are focused on or have elements of research, education or entertainment. The leading search engine, Google, reports that 20% of their queries are location based as an example of how even major search engines are only partially used for the purposes of local. In terms of the buying funnel it is very accurate to say that YPG Users are closer to the buying decision, which makes them highly qualified leads. If you disagree with this, I would like to hear your opinion why? On the Social Front – earlier this year I did a post on How Social is Yellow Pages Group in Canada – if you are interested, check out to see how active we are in Social Media. Search Engines – YPG listing data is distributed to Google, Yahoo and MSN. 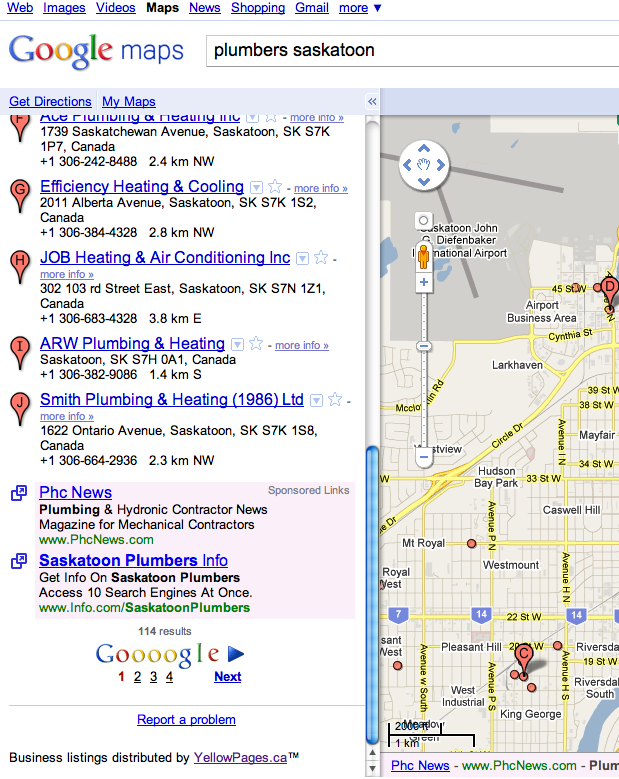 If your business is listed on YellowPages.ca, it will be listed on all major search engines in Canada. See attribution at the bottom of this sample from Google. Telcos – Distribution through major Telco websites including Bell.ca, MyTelus.com, MTS through MyWinnipeg.com, Bell Aliant, NorthernTel, TBay Tel. At the end of September, YPG and Telus announced a first of its kind relationship in Canada to preload the YellowPages Mobile Application on Telus Blackberries. Last month, YPG released an Open API called YellowAPI.com to the Development Community, read the press release here. YellowAPI.com – The Yellow API allows ANYONE to build their own applications and mashups by providing dynamic local business data. We supply you the tools to encourage innovation and expand your audience reach to 33 million people. Read more about our data and opportunities in the Overview. In June, YPG debuted its iPad Application (see my post when this was the #1 app in iTunes) and according to the press release was approaching 1 Million Downloads of its mobile applications. As of today, this number is well over 1 Million. Over 1 Million Downloads of applications, for a 100% pure Canadian application that is not a game. There are many great Canadians Applications for SmartPhones, TheWeatherNetwork, GlobeandMail, Sportnet, etc. which all are incredible in their vertical, but YPG is the only one focused solely on connecting local buyers and consumers – that is pretty cool. In terms of mobile development YPG Canada is also a leader, releasing a specific version for each major platform used by Canadians. Check out more at Yellow Pages Mobile. Although there is no 3rd party that benchmarks applications, I can tell you personally that I have talked with many of the major players in Canada and the US and at over 1M downloads, YPG is not only a leader in Canada (all agree that we likely #1) but would be a leading application down south as well. When it comes to local mobile applications, there is little doubt that YPG would be #1. If your business relies on directive advertising as a source of leads, YPG still drives a significant number of leads. In my upcoming post on revenue and the SMB portfolio, I will explain how YPG has embraced other sources of lead management for SMBs, namely Search Engines, to continue to drive its mission of connecting buyers and sellers. In the interim, I suggest you take a look at the following posts, some of these are a couple of years old but still very relevant for Small Business Owners. Hits, Page Views and Unique Visitors – Which Metric Should I Use? What Do You Think of Part 1? This entry was posted in Local, Mobile Search, Yellow Pages, YP and Local Search and tagged canadian internet landscape, iphone, mobile marketing, msn, PostMedia, sympatico, telus, yellow pages group, yellowpages, YellowPages.ca on October 20, 2010 by Darby Sieben.